If you want a good indicator of how Microsoft (MSFT) is performing, all you need to do is look at Bill Gates’ net worth. The Microsoft founder, who left his position as chairman in 2014, now has a reported net worth of $90 billion. While Gates’ net worth is at an all-time high thanks to a variety of holdings, Microsoft is also close to reaching an all-time high. As of August 25, Microsoft is less than 50 cents away from its all-time high set in the days before the bursting of the 2000 dot-com bubble. While all tech stocks were grossly overvalued in those feverish days before the dot-com bubble burst, Microsoft is on much more solid footing now. 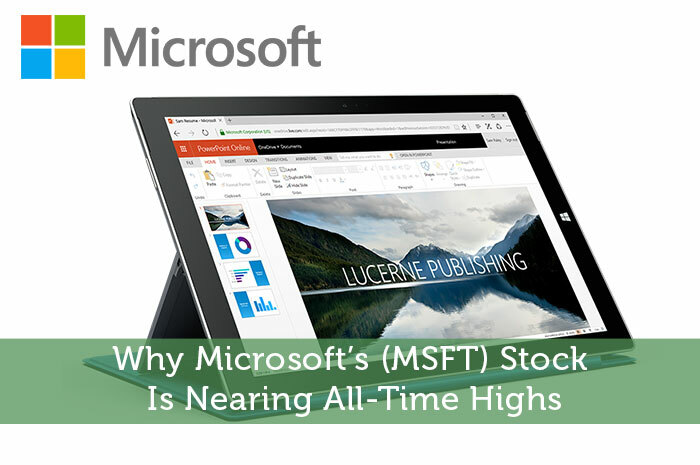 Despite being a dinosaur in terms of tech age, Microsoft has been making impressive moves after stagnating for the entire decade between 2002 and 2012. Part of that stagnation has to do with their disastrous mobile phones division. Another reason was a supposed lack of innovation. It’s been a long and difficult road, but Microsoft is once again delivering to investors. Here are some of the biggest reasons Microsoft is exciting again. Microsoft was bleeding money in the past few years. The mobile business was dreadful and the Surface tablet never posed a serious threat to Apple’s (AAPL) iPad. Finally, Microsoft is starting to win on the hardware side. First, they implemented massive cost-cutting measures. In 2015, they laid off more than 7,000 people in their mobile division. They followed that up with another 2,850 earlier this year, largely from that same division. As difficult as layoffs may be, there’s no doubt that Microsoft desperately needed to change the structure of its hardware business. Their acquisition of Nokia ended up losing $7.6 billion. The acquisition was for $7.2 billion, making the write-off spectacularly dismal. That’s all in the not-so-distant past. While nobody wants Microsoft’s phones, the company has been getting rave reviews for their latest iteration of the Surface Pro. While this tablet/laptop hybrid has a long way to go in catching up with Apple, the division generated $4.1 billion in Q4 2016. That’s a big improvement from the incredible $1.7 billion the Surface product line lost in its first two years of existence. Software has always been the core business at Microsoft, yet a decline in PC sales has made an impact on Microsoft’s bottom line. Helping to make up for those losses is Microsoft’s cloud services, which have shown phenomenal growth. In Q4 2016, its Azure division showed quarterly growth of 102 percent. Total revenue exceeded expectations and brought in $6.7 billion. The beauty of Microsoft’s promising cloud division is that it won’t be as affected by slowing PC sales as some of the company’s other segments. It’s a great way to future-proof their business. Microsoft made a huge splash when they scooped up LinkedIn for $26 billion. The deal has its share of supporters and detractors, but there’s no doubt the deal is an interesting opportunity for Microsoft. With the power of LinkedIn’s professional audience, Microsoft has access to offer its Office products to a slew of new customers. LinkedIn’s potential final earnings announcement before joining Microsoft gave more credence to the bulls supporting the deal. LinkedIn exceeded expectations thanks to strong revenues of $933 million. Already, it looks like the LinkedIn deal is a much sounder decision than Microsoft’s earlier acquisition of Nokia. If Microsoft can get it right, they’ll be in an even stronger and more diversified position than before. Regardless of what happens, nobody can accuse Microsoft of being willing to accept the status quo anymore.